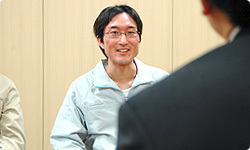 For the last part of this series, I would like to interview the five development staff members involved in the sound, design and planning of Wii Fit. Please start by introducing yourselves. 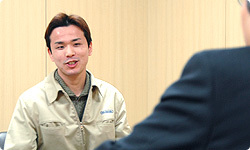 I’m Toru Minegishi from the Sound Group at EAD’s Software Development Department. I was primarily involved in the background music for Wii Fit. Previously, I was involved in the sound development for the Animal Crossing and Zelda series, and with Twilight Princess1 I worked as main composer2. 1 The Legend of Zelda: Twilight Princess, a game released for Wii and the GameCube in December 2006 in Japan and Europe and Autumn 2007 in South Africa. 2 The person in charge of composing and compiling the game music. I’m Yohei Miyagawa, also from the Software Development Department. I’m a sound programmer, and for Wii Fit I was in charge of programming the sound effects. My last project was Twilight Princess, for which I mainly produced the sound effects. My name is Yoshiyuki Oyama, and I’m a designer in the Software Development Department. Until now, I’ve mainly worked on games in the Zelda series. I was in charge of character design for Majora’s Mask and The Wind Waker and enemy design for Twilight Princess. For Wii Fit, I worked as design director for the first time. 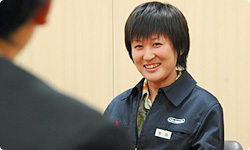 I’m Mari Shibata, also a designer from the Software Development Department. I found myself included in the Wii Fit team soon after joining Nintendo, and I was mainly in charge of designing the 3D backgrounds. I temporarily left the team to help with the 3D design for Wii Sports and Wii Play, but I returned to the Wii Fit team as soon as I was finished. 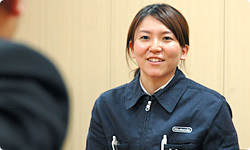 My name is Arisa Hosaka, and I’m in charge of planning at the Software Development Department. For Wii Fit, I planned some of the Balance Games. Before that, I was in charge of planning for Wii Play, and before that I was writing messages for Animal Crossing: Wild World3. 3 Animal Crossing: Wild World: A communication-based game released for the Nintendo DS in April 2009 in South Africa. Now, the three gentlemen here have all been involved in developing Zelda games. What were your first impressions when you were suddenly asked to go from making Zelda games to making a game that would allow users to weigh themselves every day? The Zelda games and Wii Fit sit on really opposite ends of the gaming spectrum, so my first impression was, “This is going to be really different.” Having said that, I had an interest in body balance long before I started working on the Zelda games. It’s almost as if you were destined to work on Wii Fit! (laughs) Were you assigned to join the Wii Fit team because someone on the development team knew about your interest in balance? I’d never told anybody about my interest in balance, so this was really a coincidence. Anyway, that’s why when I was given this assignment, I actually thought it was right up my alley. Besides, I had worked on games like Talent Studio4 that didn’t fit in with Nintendo’s powerhouse games like Zelda, and I thought that having had experience in completely different projects would allow me to approach Wii Fit with a more open mind. 4 Mario Artist: Talent Studio, an art tool for exclusive use on the 64DD accessory for the Nintendo 64 released only in Japan. They really are completely different games, aren’t they? (laughs) What about you, Miyagawa-san? What was your impression? It was enough for me to want to gain at least 3 kg when I weighed myself in Wii Fit. In spite of that, though, I’m actually pretty health-conscious. I’ve always been interested in what foods I should eat and what exercises I should do to keep my body healthy, so my first impression of Wii Fit was that it was just the right kind of project for me. I actually enjoy showing my friends what’s good to eat and what’s not! (laughs) Even while I was working on Twilight Princess, I was very interested in working on games like the Touch! Generations series5 that had content that could be directly applied in your daily life. There’s something really appealing about being able to reflect the knowledge you gain in a game in real life instead of enjoying myself within the game world. In that sense, too, I was really glad to be included in the Wii Fit team. 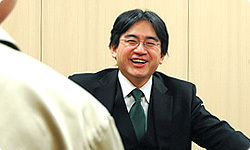 5 A series of Nintendo DS and Wii games such as Dr Kawashima’s Brain Training and Nintendogs specifically designed to appeal to both men and women of all ages. You would think that someone involved in developing Zelda games would have felt a bit apprehensive when being told that their next game would revolve around health. But Minegishi-san felt a spiritual bond with Wii Fit, while Miyagawa-san was all but waiting for a project like this to land in his lap. What about you, Oyama-san? You’d been working on nothing but enemy design for a long time. On a sidenote, I interviewed Oyama-san last year for the Zelda series of Iwata Asks6, where he talked about designing enemies for Zelda. 6 Interviews by Mr Iwata with the development staff of The Legend of Zelda: Twilight Princess that were published on Nintendo’s website. The first thing I thought when I was assigned to the Wii Fit team was, “What’s this team working on?” Even though I was in the same department, I had heard almost nothing about this project and I had absolutely no idea what the team was working on. Besides, for the past three years I had been doing nothing but designing enemy characters for Zelda games. I didn’t even know what they expected from me! (laughs) That’s why, unlike some of the other team members, I didn’t feel anything like I was destined to work on Wii Fit. (laughs) Having said that, I do remember approaching Wii Fit as a completely novel piece of software, and I considered the ways in which I could reflect my experience in this project. This was your first time directing a game’s overall design, wasn’t it? Even if Wii Fit isn’t on the same scale as the Zelda games, you must have felt a different sense of responsibility coming into this project. For Twilight Princess I was placed in charge of the enemy design staff, so I’d already had some experience directing. But with a Zelda game, there’s already an existing stylistic blueprint in place to which all you need to do is add individually-designed parts. With a completely new piece of software like Wii Fit, I realised that I would have a major responsibility in finding the best ways to compile all the different bits of design that each designer would be turning over to me. 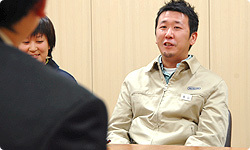 Now, Shibata-san, I understand that you attended one of our Nintendo Game Seminars7. Having attended the seminar and subsequently being employed by Nintendo, you must have been excited at the thought of working on your first game. What was your reaction when you were told to work on a game that would allow users to weigh themselves every day? 7 A hands-on seminar run by Nintendo in Japan that allows university students to gain experience in game production. I actually wanted to work on a Zelda game! (laughs) But ever since my days attending the Game Seminar, I had been hearing that it was important to develop as many different types of game as possible to increase the gaming population, and that it was important to put more effort into games that appeal to female users. Especially now that female gamers make up more than 50% of all gamers for both the DS and Wii8. 8 Announced at the corporate strategy meeting held on October 26, 2007. In that sense, I felt that I would be able to contribute to the Wii Fit team as a representative of female gamers, and I was satisfied with that. Since I was the first female member to join the team, I was bombarded by questions from everyone else, asking me for a female point of view. Yes, especially since this was my first job! (laughs) At the same time, this was a game that nobody really knew how to approach, so I thought even as someone new to Nintendo, I would have something to contribute to this game. You were dragged in to help out with Wii Sports and Wii Play last year when development on those two projects entered the busiest stages, weren’t you? Those two pieces of software were going to be released simultaneously with Wii, so I was in a position where I had to think very carefully about what customers using Wii for the first time would think and help out with the final touches of the games. That was a very important experience for me. I feel like it’s a tradition of the Entertainment Analysis & Development Division for team members of less busy teams to run over and help out with extremely busy teams. Hosaka-san, when did you join the Wii Fit team? I joined soon after completing work on Wii Play, so there were already a few prototypes of games requiring the use of balance. My first impression upon playing them was that this looked to be a fun project. When I was working on Wii Play, we experimented a lot with different ways of using the Wii Remote, and when I joined the Wii Fit project, I was ready to discover new ways to control games using the Wii Remote. But then you discovered that with Wii Fit, you would be controlling the game not with a Wii Remote, but by standing on an accessory similar to bathroom scales and shifting your centre of balance. You were in charge of planning, so I’m guessing that you started coming up with ideas and testing them as soon as you joined the team? Yes. When I joined the team, we didn’t have any fully functioning Balance Games, so we began by brainstorming ideas and developing them into prototypes. But during this phase, I suffered the wrath of Miyamoto-san because we weren’t coming up with enough ideas. Miyamoto-san gets pretty scary when he’s angry, doesn’t he? Yes! (laughs) We all started panicking and just throwing around ideas, hoping that something would stick.